This tournament is anything but friendly. I prefer to call it “assisted suicide.” Starting with the Bundesliga giants, Bayern Munich. While they aren’t to be blamed in any way, they will be pulling the plug on Milan fans’ hopes and dreams tonight. Coming off of four straight league titles and other assorted shiny objects, if their talent and skills don’t kill you, their coach probably will. He will seem mildly familiar to most Milan fans, having won a Scudetto, two Champions League trophies, two UEFA Super Cup trophies, a Coppa Italia & a Supercoppa, and a Club World Cup with the red and black. Bayern fans call him Carlo Ancelotti or maybe Mr. Ancelotti, but we know him as Carletto. Just kill me now. We are living in a World where Milan extended the ever-inconsistent and whiny faux-captain Montolivo, and Matri is still in our midst. A world where Poli’s sale has been blocked (and someone reportedly actually asked for him,) and our best striker, two new players, and more will be watching from Milano at 3am instead of helping us on the pitch. A world where a man nicknamed after a little airplane is bragging about how much the players are enjoying themselves in his practices. But also a world where we struggled to beat the 14th place Ligue 1 side. This same little man talks about a possession-based game in which our team is supposed to dictate the play, but I have yet to see them able to maintain possession. In fact, I don’t think I even need any help with my death, Milan have killed me ten times over lately. 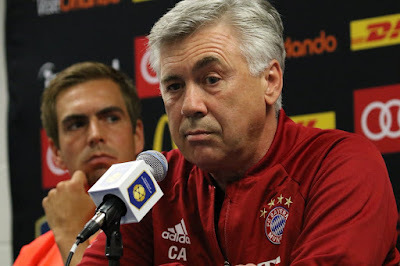 Ancelotti is a good man, a man with heart, who claims to feel for our suffering, but doesn't feel for our suffering quite enough to come coach this train wreck. So I would expect him to play the players he needs to see, get playing time, or he’s contractually obligated to play. Will he go easy on Milan for nostalgia? I’m not sure I’d respect him if he did, it’s unsporting. Besides, if he really lines up a tough squad and they pummel us as expected, that actually might be more helpful. Someone involved in the negotiations of the club might actually wake up and get something done. Or it will delay them again. Probably the latter. Just kill me. These players may have been injured in this intense possession-based store signing. So to recap, we’ll face a world class team of champions, coached by one of our dearest former coaches, who was offered the Milan bench but would rather have painful back surgery than step into this nightmare. And we get to watch the squad that relapsed last year into some form of cancer after Mihajlovic’ departure, plus the dead weight we had loaned out and a few youth players play a “new” style of football that didn’t really work against Bordeaux, so is highly unlikely to be successful tonight. Should be a great time. For Bayern fans. Just kill me now. This match will be shown (delayed) on ESPN2 in the U.S.